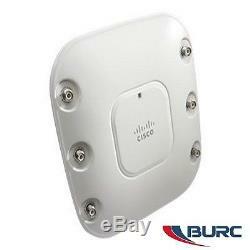 Tel: (832) 377 6079 Sell to Us IT Equipment.. Cisco Aironet 3502P - Wireless access point - 802.11 a/b/g/n. IEEE 802.11b, IEEE 802.11a, IEEE 802.11g, IEEE 802.11n. IEEE 802.3af, IEEE 802.11n. 1 x network / power - Ethernet 10Base-T/100Base-TX/1000Base-T - RJ-45 1 x management - console - RJ-45 6 x antenna. AC 120/230 V (50/60 Hz). 2.4 GHz, 5 GHz. Product Description Provided by Burc Electronics. Cisco Aironet 3500 series access point with Cisco CleanAir technology is the 802.11n access points to create a self-healing, self-optimizing wireless network. CleanAir technology is a system wide feature of the Cisco Unified Wireless Network that improves air quality by detecting RF interference that other systems can't recognize, identifying the source, locating it on a map, and then making automatic adjustments to optimize wireless coverage. This access point provides the highest-performance 802.11n connectivity for mission-critical mobility. RF excellenceBuilding on the Cisco Aironet heritage of RF excellence, the 3500 series delivers industry-leading performance for secure and reliable wireless connections. Enterprise-class silicon and optimized radios deliver a robust mobility experience using Cisco M-Drive technology. ScalabilityThe Cisco Aironet 3500 series is a component of the Cisco Unified Wireless Network, which can scale up to 18,000 access points with full Layer 3 mobility across central or remote locations on the enterprise campus, in branch offices, and at remote sites. The Cisco Unified Wireless Network is the industry's most flexible, resilient, and scalable architecture, delivering secure access to mobility services and applications and offering the lowest total cost of ownership and investment protection by integrating seamlessly with the existing wired network. We accept Pay Pal and wire transfer. We do not mark merchandise values below value ormarkitems as "gifts" - US and International government regulations prohibit such behavior. Claims for damaged/missing items must be received within 7 days of receipt of merchandise. Burc Electronics has been providing services for five years. We have served thousands of customers around the world and our customers are fully satisfied from our services. Our business is growing day by day because of our secure, trustable and reliable services. All of our items undergo several necessary rigorous tests and re-conditioning in order to make sure that out items works absolutely. We know our customers requirements and we try hard to provide the best that fits to those requirements. The item "NEW SEALED Cisco AIR-CAP3502P-A-K9 Access Point 1YearWarranty 2+Available" is in sale since Monday, January 04, 2016. This item is in the category "Computers/Tablets & Networking\Home Networking & Connectivity\Wireless Access Points". The seller is "burc2010" and is located in Houston, Texas. This item can be shipped worldwide.